Say the word Disney and everyone in the room will recognize it. For years, Disney has continued to provide us with fun characters, entertaining movies, and loads of stars from their powerful empire. It is always fun when you get up close and personal with the stars of the world of Disney. 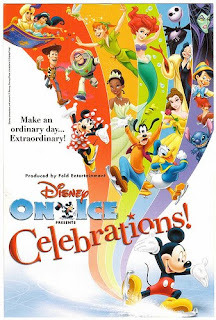 On October 30, Kaden and I (along with family) will attend the Disney on Ice show at the 1st Mariner Arena in Baltimore, MD. I have not been to a show like this since I was a young girl. This should be exciting for everyone. We attended the circus earlier this year and had a blast. These opportunities are afforded to us thanks to the The Mom Central Feld Family Activator program. I am happy to represent the Baltimore area. Instead of hosting a giveaway on my blog, I decided to donate a 4-pack of tickets to the P.T.A. at my son's school. We are attending an Ice Cream Social tomorrow, so it is only fitting to hold the giveaway at this event. I cannot always find the time to volunteer, but whenever I have the opportunity to contribute, I pledge to do so. The coupon code is MOM — four tickets for $44 Monday-Friday, and $4 off tickets for all weekend performances. The tickets can be purchased from http://www.ticketmaster.com <http://www.ticketmaster.com> and by entering the MOM code in the “MC promotion” box when purchasing tickets. Minimum purchase of 4 tickets required; additional tickets above 4 can be purchased at $11 each during the week and $4 off on weekends. I will share pictures and a review of our night at the show in a couple of weeks. I am sure I'll have lots of exciting news to report. Until then, if you are interested in joining the Feld Family Activator program, please leave a comment on this post , or contact me at keonte.smith@gmail.com. I was provided a 4-pack of tickets to attend this event thanks to MomCentral as a member of the Feld Family Activator program. The views expressed in this post are my own, and are not intended to sway your thoughts or opinion. Your experience may/may not vary.